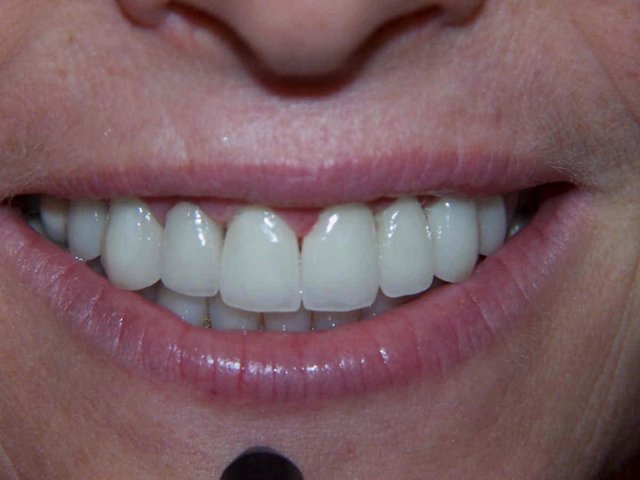 Having tooth pain after crown (a "cap") is quite common. In my experience as a dentist over more than 35 years, I would say that about 30% of patients experience some sort of tooth pain after getting a crown, BUT it's usually only short-term. Tooth pain can be split broadly into THREE levels of intensity and duration. How bad the pain is, and how long it lasts for will tell you if it might settle down on it's own, or whether you need to go back to the dentist. The first level of a tooth pain after crown, the simplest, is sensitivity to hot or cold. When you have a hot or cold drink, you get a brief but intense stab of pain. It's GONE inside 15 seconds or so. This is not unusual after getting a crown fitted, for 2 to 4 days. After that, the tooth settles down, and all is good. This sensitivity is caused by the nerve inside the tooth being irritated by the dental treatment involved in getting a crown. More about this below. The second level is more borderline. You get that intense pain with hot or cold drinks / foods, BUT it lingers on for a few minutes afterwards, maybe up to half an hour. This is SIGNIFICANTLY different. By taking much longer to settle down, the tooth is telling you that the nerve inside is inflamed. This is now a 50/50 situation. That means that there's about a 50% chance of it getting better. But ALSO a 50% chance of the toothache getting worse. In some cases, the tooth will eventually settle down. The other cases will NOT settle, and the tooth continues to be sensitive to temperature, lasting for quite some time AFTERWARDS. It may even become a bit tender to bite on. The THIRD level is much more clearly cut. The tooth reacts to hot drinks or hot food, BUT - and here is the SIGN - the pain comes on AFTER the hot drink / food, and lingers for 30 to 60 minutes afterwards. AND the tooth can ache at any time, without any hot or cold. And if COLD water makes it better - then the tooth nerve is dying. You need root canal. This is certain. 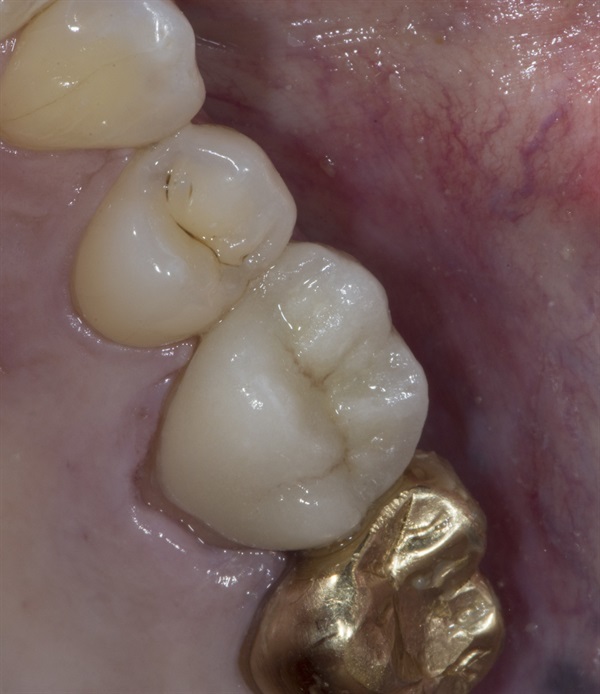 The image above shows a tooth-colored ceramic crown next to a gold alloy crown. 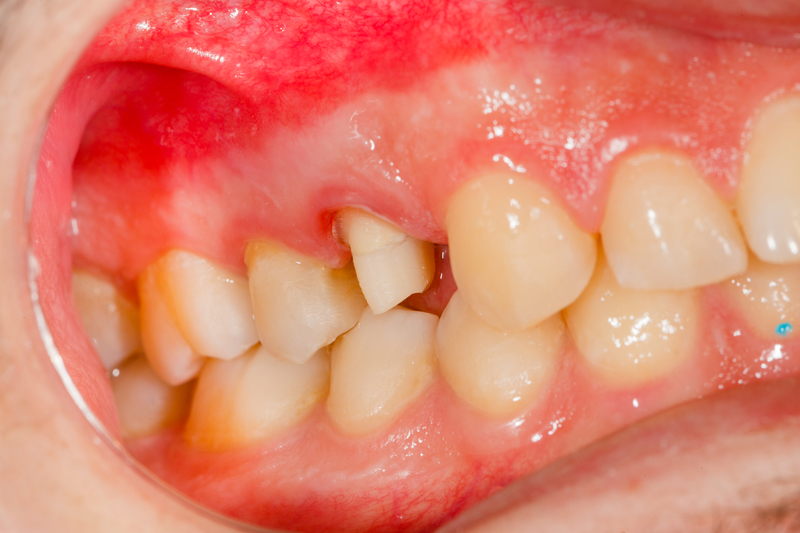 BUT WHAT CAUSES THE TOOTH PAIN AFTER CROWN? The pain always comes from the nerve, buried deep inside the tooth. I always tell my patients that it's like the lead inside a pencil. It goes down the middle of the tooth, in its own tiny channel. When the tooth gets a shock, like a knock or a blow, OR bacteria in tooth decay get into the nerve, it reacts with inflammation - like any other part of the body. And inflammation means the area is flooded with white blood cells, and this results in swelling. BUT there's no room inside the tooth nerve channel for any swelling. The tooth nerve is encased inside a small space in the middle of a rigid, stiff tooth. SO, the pressure inside the tooth increases, and the nerve becomes compressed, or "pinched"! The nerve becomes compressed, and the tiny blood vessels that supply the nerve get compressed too. So the blood cannot flow through the blood vessels as normal. SO, the nerve is starved of blood, and therefore starved of oxygen. Without oxygen, the nerve starts to die. And it becomes PAINFUL. Imagine that you have hit your thumb with a hammer. Your thumb will swell up. You can get rid of the cause - you can throw the hammer away - BUT it's too late. Your thumb is already swelling up. But with a tooth nerve, there is no space inside the tooth for the nerve to swell up; it just gets compressed. MORE OUCH! Tooth Pain After Crown - What are your options? You can get root canal treatment. Read all about this at Root canal procedure. That's it. These are your ONLY 2 options if you are having tooth pain after a crown that doesn't settle down. BUT let's back-track a bit. I've outlined the worst-case scenario above. What about the less severe cases? How do they come about? What are the causes? 1. The cement used to fit the crown. Most are acidic, some more than others. Why? Because the acidic nature of the cement creates a chemical bond to the tooth. So the crown is not held on just by a cement that fits well, it actually sticks to the tooth. So it's stronger. BUT the acidic nature of the cement can irritate the tooth. Once the cement has set fully, the acidic element becomes neutral. Normally, the tooth will settle down within a week to 10 days. 2. The crown is a little too big; This means that when you bite, the crown hits the opposite tooth slightly before any other tooth. It may be obvious to you - you can feel that the new crown is too high. BUT sometimes it's only SLIGHTLY high, and you you don't really notice that it's hitting the other teeth. In both these cases, the tooth nerve becomes irritated by the constant trauma, and then gets inflamed, causing tooth pain as I've described above. 3. Dental decay. Dentists call this caries. If you tooth had a cavity before you got the crown fitted, your dentist will have removed all the decay from the cavity before filling the cavity and fitting the new crown. BUT sometimes the bacteria in the decay have penetrated deeper into the tooth than the decay. So, when the dentist thinks he has removed all the decay, there may still be bacteria left behind. These bacteria can slowly travel into the tooth nerve, and trigger the inflammation that leads to tooth pain after crown. 4. Finally, the drilling on the tooth that the dentist has to do, to grind it down to the correct shape to fit a crown over, can irritate the tooth nerve too. Sometimes it's the vibration of the drilling, but mostly it's the heat on the tooth generated by the friction of the drill. Water spray is built into dental drills, but sometimes the surface of the tooth can still be overheated, resulting in inflammation of the tooth nerve, and so tooth pain after crown. AND OF COURSE - frequently it's a mixture of several of the potential causes. So there is no ONE cause, it's two or three of the possible causes occurring together. I hope I have been able to explain tooth pain after crown so that you have some idea of whether it's going to get better on it's own, or whether you need to go back to your dentist for and adjustment, or other treatment. REMEMBER - there's much more information in my 80 - page e-book The Toothache Survival Guide. Check it out now, it's only $9.95 to download. You may also be interested in this page at Colgate about pain after a crown.